This collection of fragments once belonged to Étienne Baluze (1630-1718). It has no number in his library and doesn't appear in the posthumously printed catalogue (Bibliothecae Baluzianae pars tertia, Paris, 1719), as it was considered a part of his personal papers — now the “Baluze” collection at Paris' National Library. 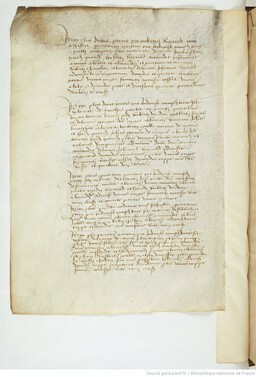 A complementary collection of fragments sharing the same peculiarity is now “Baluze 271”; Baluze had other fragment collections that were considered fully part of his library and described in the printed catalogue, and are now scattered across the “general” manuscripts collections of Paris' National Library (e.g. lat. 152 olim Baluze 545; lat. 5288 olim Baluze 439). Also, while these were studied, I noticed that Baluze 270 ff. 124-131 complete Paris lat. 5288 (olim Baluze 439) ff. 34-41. But nothing indicates whether these fragments also come from Lyon. Other fragments preserved in these or other Baluze's collections may also belong together and may have not been identified as such yet. Codices that survive only through these scattered fragments (that is, all of the above mentioned except Lyon 484 and Lyon 336) were virtually reconstructed here.